The life of a movie screener is a crazy one. The one thing I tell my sister all the time is that you have to “commit to the crazy” because screening movies on a regular basis is not for everyone. I will go into more detail at a later time. It was cold and rainy last night. I didn’t have an umbrella and I thought about going home several times but of course since I have completely committed to the crazy, I met my son and with my jacket and new work shoes slightly wet, I headed to ICON. There were three screenings last night. I had passes to see “The Good Lie” because I missed it a couple of weeks ago but I also had tickets to see “The Theory of Everything”. What I didn’t have were special passes to see FURY. I should actually be sitting in the theater watching it at this moment instead of updating but thanks to some movie screening buddies, I was able to screen FURY instead. I had to do a little research on this one folks and guess what? It is not an adaptation of a book I haven’t read, go figure. FURY was written and directed by David Ayer who was born in Illinois. Interesting. He is best known for Training Day and most recently, Sabotage. FURY is a Sherman tank with its crew of five brave American soldiers in the U.S. Army, battling Nazi Germans during World War II in April 1945. Seriously, I could stop right here and just stare at his photo. 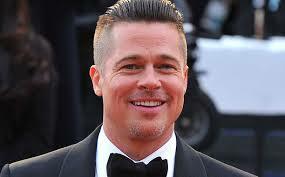 Brad Pitt, stars as the Don “wardaddy” Collier, Staff Sergeant, head man in charge of his Crew. After many battles together, throughout Europe, Sherman Tank has become his home, their home. I believe this role took Brad to another level as an Actor. Of course, I could be wrong but then again, it’s just my opinion. There was so much expression and emotion in his eyes. He really didn’t even need to speak, his eyes told the story. Despite not being able to understand the dialog a few times, Brad speaking German was pretty hot. He nailed it! Supporting cast Shia LaBeouf as Boyd “Bible” Swan, Logan Lerman as Norman “Cobb” Ellision, Michael Pena as Trini “Gordo” Garcia and Jon Bernthal as Grady Travis. 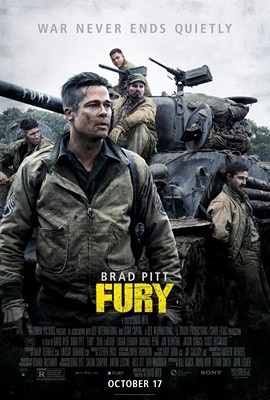 FURY is intense, there’s plenty of action and testosterone. However, I was surprised by the underlying sensitivity portrayed by this crew considering how much graphic killing is involved. The relationship of these characters in the midst of a brutal war adds an endearing depth that invokes a lot of emotion and keeps you hanging on to the veeeerry last moment of the film. ABSOLUTELY worth the big screen! It’s hitting theaters just in time for Oscar season, I’m predicting multiple nominations, I’d be shocked if didn’t get at least 1 nod. Posted on October 15, 2014 October 16, 2014 by Denyel ReedPosted in Movie ScreeningTagged Brad Pitt, fury, shia labeouf. Previous Previous post: The Liebster Award!!! Nice review. Since it is hitting theaters for Oscar season, I will see it.